Mayonnaise hatred: A brief history of mayo and disgust. Why do some people hate mayonnaise so much? Elsewhere in Slate, David Merritt Johns explains the history of mayonnaise, Ari LeVaux tries to find out why Hellmann’s is so good, and Katherine Goldstein argues in favor of a surprising mayonnaise alternative. Near where I work there is a deli with a basket on the counter piled high with mayonnaise packets. They’re complimentary: If you buy a sandwich, you can take as many as you want. I know that decent folks nab just one or two, but I have a hard time sticking to that amount. I prefer four: two to lubricate the bun, and two reserve packets for use ad libitum on bites that demand an extra squirt of condiment. I find that if there’s mayo left in one of the reserves after the sandwich is gone, I can slurp it directly from the packet. I slurp covertly, of course: I’m ashamed of my four-packet-a-day habit, which, if I’m being honest, typically involves a fifth packet. One day a friend espied me clutching a turkey and cheese, its half-eaten face white and glistening, as my free hand applied more sauce. “You are disgusting!” she said. She was right: I have a mayo problem. But as my shame faded, I began to wonder: Was the problem really mine, or was it hers? 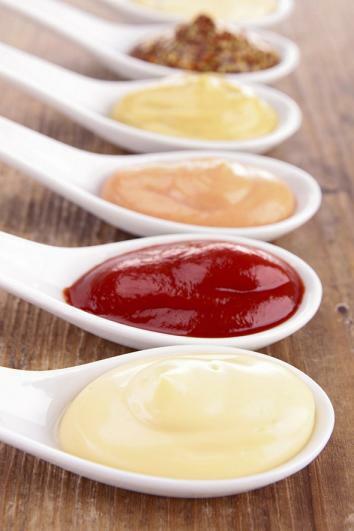 Ketchup and mustard—our nation’s uncontested condiment king and queen—elicit no ire. But mayonnaise, an egg and oil spread whose 100th birthday under the label Hellmann’s arrived in September, is a source of endless controversy: BuzzFeed ran an article recently calling it “the devil’s condiment,” and Jimmy Fallon, Rachael Ray, and President Obama are all on record as mayo haters. What accounts for this condimental controversy? Why are we so divided over mayonnaise? “Anytime somebody orders a corned beef sandwich on white bread with mayonnaise, somewhere in the world, a Jew dies,” goes one version of the old Milton Berle joke. The joke works on two levels: It may be that the Jew is dying out of horror at a clueless deli patron, since everyone knows corned beef goes with mustard and rye. Or it may be that the Jew is dying because she herself has chosen mayo and white, and therefore is no longer a Jew. In either reading, the mayo critique is clear—Keep your slime off my food!—a protest that critics of the sauce would make ever more emphatically as the 20th century wore on. A more fundamental—and deadly serious—threat to the hegemony of mayonnaise would come from public health advocates—who, like the comedians, insisted the nation’s appetite for the sauce had simply gone too far. By the 1960s scientists were sounding the alarm that eating too many cholesterol-rich foods such as eggs was perilous for the heart. In 1970 the New York Times, responding to reader requests for advice on “foods that do not clog the arteries,” described a typical lunch for heart disease epidemiologist Jeremiah Stamler: “A sliced turkey sandwich, no butter, no mayonnaise, coffee with skimmed milk, and melon.” Health anxieties over mayo expanded further with reports linking raw egg consumption to salmonella poisoning. Out of these ingredients congealed the organized anti-mayo movement. The flagship organization, the Worldwide I Hate Mayonnaise Club, was launched in the late ’80s by Honolulu-based writer Charles Memminger, who declared his intention to combat the “evil empire of slime.” A few years later, in 1991, a dozen college students at Wesleyan University formed the Wesleyan Anti-Mayonnaise League (WAML). The League formed to protest the daily appearance of large tubs of mayo in the college’s cafeterias, which, according to WAML founder Jenny Gotwals, “would get SO GROSS sitting out all day.” (Gotwals included a pledge to “never bring tuna or mayonnaise into our home” in her wedding vows.) In 2006 marketer Craig Horwitz launched the web site HoldThatMayo.com. “When you order a BLT, there’s no ‘M’ in it. … It should not be the default. That’s our political position,” he explained. What do these century-old barbs suggest? Is it possible, as mayonnaise haters contend, that there is some offensive element intrinsic to the sauce itself that gives rise to mayophobia? In late September I attended a mayonnaise-themed picnic hosted by Hellmann’s to celebrate the 100th anniversary of the company’s mucilaginous muck. The firm had constructed the longest picnic table in the history of the planet on Pier 84 in New York City to celebrate its special day, and in the ardent hope that a Guinness world record might accompany its richly anticipated mayo-infused super-moist chocolate birthday cake. A cheerful twentysomething in a Hellmann’s T-shirt passed me a box lunch containing a mayo-infused burger, mayo-smothered pasta salad, mayo-lubed corn on the cob, and a mayo-moistened cupcake. I asked her if it was awesome to work at the Hellmann’s event, since I assumed she got to eat as much mayonnaise as she wanted. She was a bit off-message: She admitted she thought mayo was disgusting. “I think it’s just when I was little I didn’t like things that were white,” she said. What does it mean to say that something is disgusting? It is a surprisingly juicy question, and one that has stimulated a gush of scholarship in recent years. Research into human disgust suggests that substances of animal origin, such as poop or mucus, are more commonly offensive than plant matter. Disgust theorists often explain this pattern by noting that rotten flesh can harbor deadlier microbes than moldering plants. (The grossout response presumably serves to protect us from noxious things.) Research conducted in the U.S. suggests that slimy, gooey, filmy, mushy, and squishy things may arouse disgust. In the 1990s Army researchers concluded that the most widely disliked food item was liver. But Rachel Herz, a smell scientist and author of That’s Disgusting: Unraveling the Mysteries of Repulsion, thinks it can be done. Food meanings can change dramatically, notes Herz, who believes that the consumption of insects as food will soon take off in the U.S. (“I think in another 10 years you might be having mayonnaise on your cricket sandwich,” she says.) If mayonnaise could recapture the trendiness and luxury status it once held—perhaps via a renaissance in hip restaurants or an association with glamorous people—the haters might well change their tune, Herz says. “People will be like lining up to get those little packets and squirt them into our mouths,” she said with a giggle.